The Jon Michael Moore Trauma Center, in partnership with the American College of Surgeons, is taking part in the national “Stop the Bleed” initiative. Participants in the programs are being trained to stop bleeding in order to prevent death from hemorrhage. The center not only offers training sessions to students, but has been able to train local law enforcement, sororities, fraternities, local businesses and many other groups. Train-the-trainer events are being held as well to increase the number of sessions the center can offer. 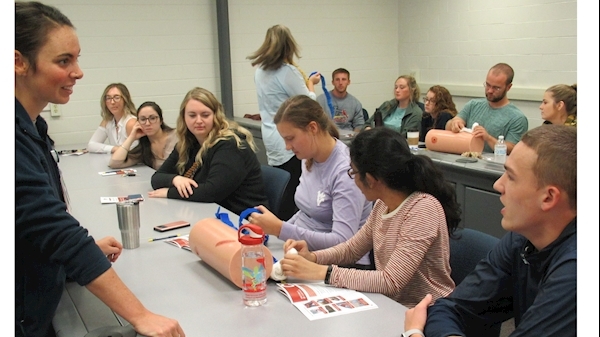 The more communities Stop the Bleed is able to reach, the larger the decrease in death from hemorrhage and the increase in overall community safety. Groups and organizations wishing to receive Stop the Bleed training should contact the Jon Michael Moore Trauma Center at 304-598-4659. For more information on the Stop the Bleed campaign, visit www.bleedingcontrol.org. For more information on the Jon Michael Moore Trauma Center, visit www.wvumedicine.org/trauma.